Prof. Frank G. Holz (University of Bonn) dedicated the ISS 2018 to Dr. Gerhard Zinser. The 16th International SPECTRALIS Symposium (ISS) did not only take place at a historical event venue – the former plenary chamber of the parliament in Bonn, Germany – but also made history itself. It marked the largest Heidelberg Engineering Academy ISS to date, with more than 400 SPECTRALIS® enthusiasts from all over the world coming together, presenting innovative research studies, learning about new imaging modalities, and discussing the ethical, as well as clinical dimensions of Artificial Intelligence. In his welcome speech, the course director of the ISS 2018, Professor Frank G. Holz from the University of Bonn, reminded the audience of the city’s rich history, when he referred to great researchers and artists like Helmholtz and Beethoven, who once resided in Bonn. He also dedicated the symposium to Dr. Gerhard Zinser – the late co-founder of Heidelberg Engineering. Professor Robert N. Weinreb (University of California, San Diego) connected future and past in his “Gerhard Zinser Memorial Lecture”, in which he paid tribute to Dr. Zinser for his innovative mind. 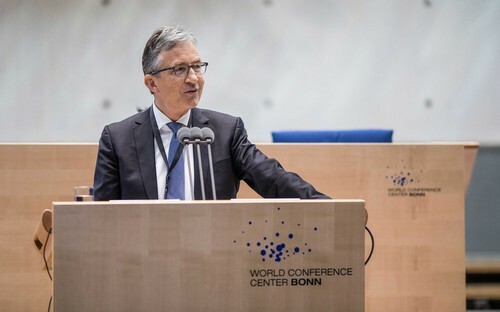 He described the inception of Heidelberg Engineering in 1990 as “a courageous and bold move” of Dr. Zinser and his co-founder Christoph Schoess, and honored the HRT and SPECTRALIS platforms as disruptive technologies. Reflecting on a general trend in ophthalmology, OCT angiography (OCTA) and its clinical relevance generated significant interest. Roberto Gallego-Pinazo (Oftalvist Clinic, Valencia & Madrid), for instance, gave an update on classification methods for neovascular lesions in patients with AMD. He outlined the importance of structural OCT and multimodal imaging for the diagnosis and management of neovascular AMD, also stressing that OCTA could provide key features for an optimal therapeutic approach. Thus, high-resolution OCTA images will play a major role in the future. High-quality research studies provided also novel insights into the diagnosis of glaucoma and other optic neuropathies. Robert N. Weinreb showcased the possibilities OCTA holds for diagnosis and management of glaucoma, reflecting on a broader discussion whether structural change can be detected before functional change is identified through visual field measurements. To better refine glaucoma diagnostics, Dr. Christopher Girkin (University of Alabama at Birmingham) investigated possible mechanistic biomarkers, while Dr. Christian Mardin (University Erlangen-Nuremberg) presented characteristics of highly myopic eyes, which are more difficult to diagnose as glaucoma. These researches had also contributed to the Heidelberg Engineering Academy “Glaucoma Imaging Atlas”, that was introduced at the ISS and sold out within minutes. It is a culmination of extensive interpretation of OCT images as well as data, and features about 30 detailed case studies of patients in various stages of the disease. Additional highlights of the ISS meeting were investigational imaging techniques and Artificial Intelligence (AI). The need for quantitative imaging was very well illustrated in Dr. Alastair Denniston’s (University Hospitals NHS Trust and Queen Elisabeth, Birmingham) talk about “The Future of Uveitis Care”. He reported that a quantitative analysis of high-resolution repeatable imaging provides objective measures needed to optimize the treatment of Uveitis and other diseases. Chantal Dysli (University of Bern) and Dr. Lydia Sauer (University of Utah) demonstrated the value of Fluorescence Lifetime Imaging Ophthalmoscopy (FLIO) as a diagnostic method. While Dr. Dysli outlined how disease specific fluorescence lifetime patterns can assist in the early detection and diagnosis of retinal diseases, Dr. Sauer featured a specific application of FLIO as novel method to detect toxicity to the retina. The panel discussion about Artificial Intelligence brought up valuable provoking ideas as well as reasonable concerns. The second day of the ISS started with a session dedicated to AI and Big Data. Adnan Tufail (Moorfields Eye Hospital, London) started his presentation about “Machine Learning and Big Data in Retinal Disease” stating that nowadays we have a wealth of data, which can be used to enhance personalized medicine. These data sets have the potential to provide new insights and can also drive the policy change required to improve patient care. During a lively panel discussion, the ISS participants formulated important questions ophthalmologists have to focus on when introducing AI into routine practice: Who takes the leadership in this new development? Will AI replace even specified occupations (e. g. whole reading centers)? Will there be a shift of expertise levels due to AI; who will diagnose patients in the future? Can AI empower ophthalmologists to have more time for human interaction? Tyson Brunstetter, a US-Navy optometrist working with astronauts, closed the ISS with a stimulating presentation about the effects of microgravity in long-term space flight on the human eye. He specifically talked about choroidal folds that can persist well after spaceflight and are still being investigated in research studies. This subject has become a favorite at the ISS with the SPECTRALIS on the International Space Station playing a vital role in research to monitor the eye-health of astronauts before, during and after space flight. The videos of the ISS 2018 are available on the Heidelberg Engineering Academy website. The 17th International SPECTRALIS Symposium will take place at the SIGNIEL Tower on October 18-19 2019 in Seoul, South Korea.